Why we couldn't have picked a cheaper vice is beyond me. Nowadays, we enjoy a home cooked dinner & save the money for weekend eating or special occasion dinning. Besides, with some practice, conquering a restaurant dish at home is absolutely doable (and cheaper!). Even with that mindset, I'm still nervous to try a few things at home. One of those things being, sushi. My one and only attempt happened 6 or 7 years ago with an old roommate. They came out pretty good for our first go at it but I just never tried again. I figured it was time to change that. Instead of going straight to making rolls, I decided to dip my toes and just go for a hand roll since it seemed a little less involved and less likely I'd screw it all up. I used my baked watermelon recipe and also tried another marinade mix with a sesame chili oil base that turned out to be tasty. For my first shot at making hand rolls, I'm pretty happy with the overall look. My second try at them did not go so well, but luckily the flavor was there so every wimpy roll was eaten regardless. I am getting better, though! And in perfect time... today is Billy & I's 6 year anniversary and after deciding that we deserved a Wii U for being so awesome, I think we may need to save the money and eat in. I'm fine with that. Staying in is the new going out! Preheat oven to 350. Prepare baking sheet with parchment paper. Cut your watermelon into steaks and place on baking sheet. Drizzle lightly with olive oil, making sure to coat each side. Combine remaining ingredients in a small bowl. Adjust to taste- I like spicy so I tend to add a few extra drops of hot sauce. Pour marinade over watermelon steaks, coating all sides. Cover with foil* and bake for 2 hours. Reserve the juice if you'd like! *NOTE: If you bake without covering the pan with foil, it will still taste delicious but will result in more charring. This light marinade was made without measuring. Just tasted as I went. If you'd like to give it a shot, start with the chili oil and then the vinegar. Taste as you go. Add a tiny bit of minced garlic if you'd like. *NOTE: I know jasmine rice is a long-grain rice that is not used for making sushi but it's what I had on hand and it's also my favorite type of rice so I didn't mind using it as a substitute for the short-grain sushi rice. In a medium bowl, toss the rice with the rice vinegar, season with the sugar and salt to taste. You don't want it overly sweet, instead you want it to compliment the spicy baked watermelon so if it helps, take a bite of watermelon with the rice and adjust seasoning to your liking. No more than 1 tbsp of sugar should be used. Set aside. Using kitchen shears, cut the nori sheets in half lengthwise. 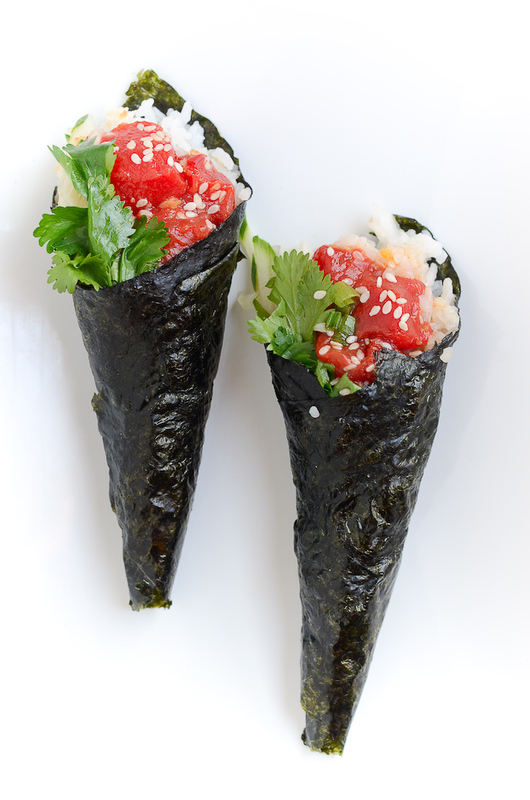 Take one sheet of nori, shiny side down, and using your other hand grab some rice and lightly squeeze to form a log. Having a small bowl of water and dipping your fingers in it before grabbing the rice helps a lot. Place the rice on the left side of the sheet, like the picture above. use your finger to make an indention for your other toppings. Place watermelon, cucumbers and other toppings of choice on top of rice. starting from the bottom left corner, beginning rolling. You can use a tiny bit of sushi rice or just a light smear of water on the end bit to keep it closed. Great use of the GIF for your last shot - it looks so awesome! I love tuna, but this vegan version looks delishh. Sushi & cheese, Erika... Sushi & cheese. These two things make it tough. I can't let them go! But I am super happy with the way the watermelon turned out. I found out after several times that I prefer to bake the watermelon without foil on top. I need to update my post with that little tidbit.